Instructors can change the settings in Moodle Mail to restrict students from sending email through the course. If disabled, students will see the Moodle Mail block in their course, but will not be able to use it. They will have to use LSU mail or other email service instead. This setting is found in the Moodle Mail Configuration menu. 2. 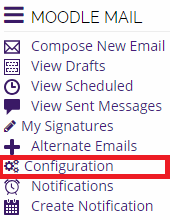 Locate the Moodle Mail block on the Moodle course page and click on the Configuration button. 3. Use the drop down box to specify whether or not you wish to allow students to use Moodle Mail. Instructors can also use the Selectable roles to limit the ability of TA's, guest instructors, etc. to use Moodle Mail. 4. When you're done click the Save preferences button.